LANCE is a nonprofit company making live combat entertainment available to a wider audience. Founded in 2015, LANCE is a fledgling company looking to expand and grow in the central Florida area. 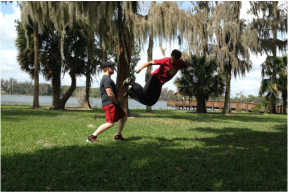 We offer training in stage combat as well as customizable performances for parties, festivals, and special events. Our Board of Governors works with troupe Committees and all LANCE members to make sure LANCE evolves into a vibrant community of performers and creatives. The Board keeps our nonprofit moving in the right direction. ​designed to be easy as well as fun! At LANCE, we train hard and play harder, and we want all the evidence we can muster to show off our good times to our friends and family. LANCE is a hobby you've got to see to believe, so click here to start believing. Currently the troupe is over thirty members strong and growing every week! 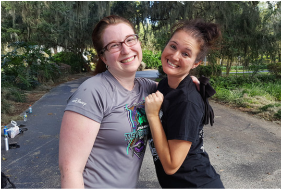 Our first major performance was at Jewitt School of the Arts in Winter Haven, Florida as a part of their school’s fundraising Renaissance Faire. 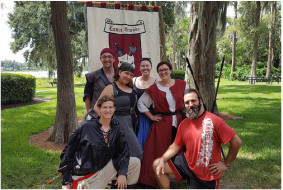 Other recent performances include tournament and themed fights at The Cloak & Blaster in east Orlando, as well as our first living chess match performance at the inaugural year of the Orlando Renaissance Fesitval! The original idea for LANCE Orlando came out of the lack of an organized stage combat troupe outside of theme parks or major entertainment venues. Ric Garcia and Olivia Lanham brought together AJ Harrett, Charles Hale, and Lane Davis to start this group. With the added help of Michael Cormier and Casey Robbins, LANCE has become a reality. Our Board of Governors has grown since we first incorporated and became a 501(c)(3) nonprofit, but we will always be thankful to the first few, the bright dreamers who made LANCE a reality. All of the fighting performed by LANCE is carefully choreographed and rehearsed. While many of the moves look painful or extremely dangerous, tedious care is taken in the training and rehearsal process to ensure a high level of safety while providing exemplary entertainment. Please do not try this at home.